Iraqi Invasion of Kuwait was the invasion that occurred during the 1990's and effected the environment, population, and economics of Kuwait. One of the most internationally significant historical event to occur in the 20th Century was the Iraqi invasion of Kuwait in 1990 and the subsequent Gulf War. Have Paper Masters custom write a research project on the Iraqi invasion of Kuwait and explicate for you why it was one of the most significant events of the 20th Century. The event is especially significant from an environmental perspective. The oil well fires that were exploded and ignited by a retreating Iraqi army sent not only a thick, black, oil-laden smoke into the atmosphere but also millions of barrels of unburned oil onto the ground surface where it formed lakes of oil that altered the landscape and poisoned the ecosystems that existed in the area. The Iraqis also dumped millions of barrels of oil into the Persian Gulf, creating a massive oil slick along the Saudi Arabian coastline that devastated seabird populations and marine life. The human devastation related to this environmental catastrophe is even more disturbing and is marked by a 1000% increase in the incidence of cancer in the region as well as a dramatic increase in the number of children born with birth defects. Although the most devastating short-term and long term environmental and health effects of this event are expected to be confined to the region of the Persian Gulf, there is evidence that allied veterans participating in the Gulf War have also exhibited many health problems that can be associated with the environmental war damage in the region. There is still no scientific consensus on the effects of this event on a global scale however some experts suggest that the environmental effects of the exploded and burning oil wells in Kuwait will last for centuries if not millennia. 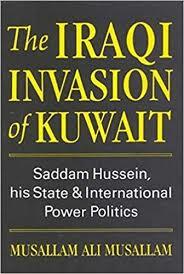 I believe that the Iraqi invasion of Kuwait was also significant from an economic perspective. The event demonstrated just how important the Persian Gulf region is as the primary source of the world’s oil supply. This supply was both interrupted and wasted as a result of the Iraqi invasion of Kuwait and the subsequent Gulf War. The short term effects included soaring oil prices and, according to some experts, the American recession that started in 1991 as a result of the $60 billion cost of the war to the United States and its allies. Macroeconomic Variables of Oil Prices - Macroeconomic Variables of Oil Prices research papers examine factors that affect oil prices. Oil Pollution in Our Oceans - Oil Pollution in Our Oceans Research Papers examine how oil pollution is caused, and the negative consequences that occur. Oil Prices - Research Papers on oil prices examine factors in the Gulf Region. Example research papers and essays on oil prices are custom written at Paper Masters. Saddam Hussein - On August 2, 1990, Iraq, led by Saddam Hussein, invaded the state of Kuwait in the Persian Gulf. Iraq and the Cold War - Iraq and the Cold War research papers account how the Soviet Union influenced the political leader Saddam Hussein. Donald Rumsfeld - Donald Rumsfeld, perhaps more than anything, is known as a man in the political arena who is an aggressive combatant in the issues he supports. War in Iraq - War in Iraq research papers illustrate that firm lines have been drawn between supporters and those who oppose military action. Order a research project on the war in Iraq from Paper Masters. Canada's Role in the Korean War - The purpose of a Canada's Role in the Korean War research paper is to reveal the causes of a conflict as seemingly obvious as the Korean War cannot be easily boiled down. Why Muslims Hate America - It is perhaps ironic then that what has been seen as the greatest US triumph in the Middle East, the 1990 Gulf War, has planted the seeds of its current crisis. Military Drones - Military Drones research papers examine the technology of unmanned combat vehicles being employed by the military. Tonkin Gulf Resolution - Tonkin Gulf Resolution gave The United States unfettered allowance to use military force in Southeast Asia. Colin Powell - He served in the Vietnam War yet he achieved fame in the Gulf War. Invasion of Iraq - Invasion of Iraq research papers discuss the impact that a US invasion of Iraq would have upon the economies of Iraq, the United States, and the international community generally. ISIS - ISIS research papers discuss the terrorist group, known as the Islamic State of Iraq and Syria, that is closely associated with Al-Qaeda. Operation Iraqi Freedom - Operation Iraqi Freedom research papers discuss the official military designation for the American-led invasion of Iraq, which began in 2003 and formally ended in 2011. Saddam Hussein's Leadership - On August 2, 1990, Iraq, led by Saddam Hussein, invaded the state of Kuwait in the Persian Gulf. U.S. Army - The Iraq War has had a negative impact on recruiting within the overall military apparatus of America's armed forces. Case Study of Khafji Joint Operations - There are many changes in management of the Oil Industry in Khafji that are discussed in A Case Study of Khafji Joint Operations. Paper Masters writes custom research papers on Iraqi Invasion of Kuwait and discusses the invasion that occurred during the 1990's and the effect that it had on the environment, population, and economics.